Rows of heirloom tomato plants spanned Brooklyn Grange Farm on the roof of an office building in Long Island City, Queens. We had just eaten samples of those heirloom tomatoes in the lobby where the farm has a market stand. The tomatoes were luscious—sweet on the tongue. I imagined I could bake a savory tart with those tomatoes. On the rooftop, Anastasia Cole Plakias, one of the founders of Brooklyn Grange, led us—The French Culinary Institute's Forager Club—on a tour on August 12th. She emphasized the importance of supporting local farms by buying their food. Eating locally grown food enhances the economy, supports farmers, and cuts down on the energy used to dispose waste and transport food into the city, she says. Gesturing to a large compost pile, Anastasia said if all of us composted, more trucks wouldn't have to dump waste somewhere else. The farm was founded by Ben Flanner, who also cofounded Eagle Street Rooftop Farm in Greenpoint, Brooklyn; Gwen Schantz, cofounder of the Bushwick Food Cooperative & CSA and farm manager at Roberta's; Chris Parachini, co-owner and CEO of Roberta's; Anastasia Cole Plakias, who recently served as communications director for Batali-Bastianich Hospitality Group's copresident, Joe Bastianich; and Brandon Hoy, co-owner and operator of Roberta's. With the help of friends and volunteers, they began planting in spring 2010. The founders had called the farm Brooklyn Grange, thinking they would be located in Brooklyn. But the arrangement fell through, and the group found another location in Queens. During the tour, Anastasia pointed out the okra plants. The okras were larger than any okra in a grocery store. The mats that have cups in them fill up with water when it rains. During dry conditions, the plants can take water from those mats, Anastasia says. The farm grows tomatoes, salad greens, herbs, eggplants, cantaloupes, okras, squashes, beets, radishes, and other produce. Pointing out a raised grate, Anastasia said, "Ben [Flanner] saw that and said, 'Canteloupe.'" We peeked around the concrete structure. Underneath the leaves were cantaloupe. Rhonda Lynn, assistant dean of student affairs, (second from left) and students listen to Anastasia (far left) talk about the farm. 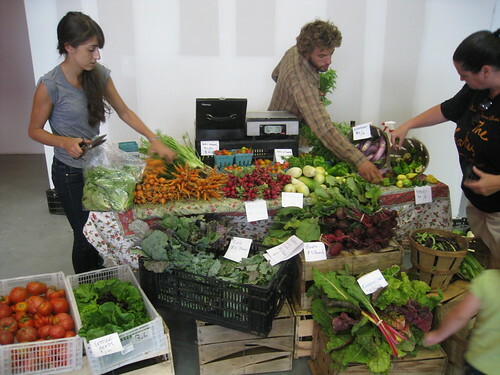 Brooklyn Grange Farm sells their produce in the lobby of the building on Tuesdays and Thursdays from 3 to 7 p.m. You can also find out all the locations where their produce is sold. 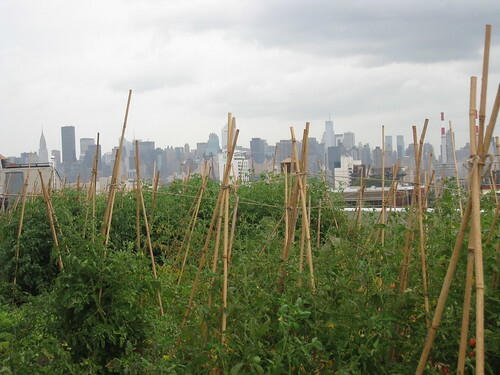 The rooftop farm welcomes volunteers on Tuesdays, Thursdays, and Saturdays. For more information, e-mail brooklyngrangefarm@gmail.com. Jenny Lee-Adrian is a student in the Classic Culinary Arts program at The French Culinary Institute. She loves going to farmers' markets and enjoys cooking with seasonal ingredients. She has a food blog called Hummingbird Appetite.